Insomnia Coffee Company has announced plans to franchise its coffee shop concept. 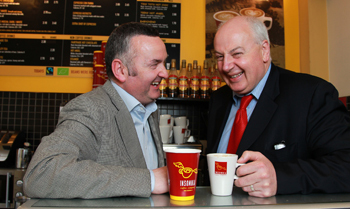 By franchising its business model, Insomnia Coffee Company will allow entrepreneurs to share in the success of the Insomnia brand, while also supporting its ambition to increase its market presence. Speaking about the opportunities for entrepreneurs Harry O’Kelly, CEO at Insomnia Coffee Company, said: “The ‘On the Go’ market within the food service channel has grown by 14.3 per cent since 2003 and is currently valued at €1 billion – this market is forecast to grow further over the next four years. Despite the difficult economic environment that persists, as a result of our focus on customers and constant innovation our consumers remain loyal and are broadening their purchase range.